It was grey and overcast as we set off for Stellwagen Bank in light rain with the hopes of finding the humpback whales that have been moving around the area for the past few days. 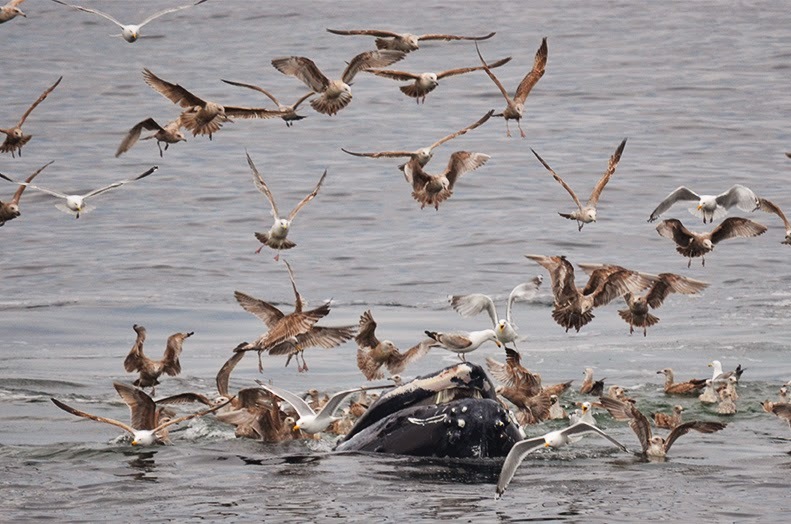 We spotted a blow and went to investigate – finding two humpback whales! Both of these whales were taking shallow non-fluking dives (the bane of every naturalist’s existence!) but were coming up quite close to the boat, even right between the bow pulpits! Our captain, Jeff asked me if I wanted to stick with these whales or go see what else might be around and I really wanted to be able to identify these whales and they were not being helpful. A few more non-fluking dives and finally I got enough of the fluke to identify Subterranean, a whale first spotted by my colleague Tasia earlier this week. 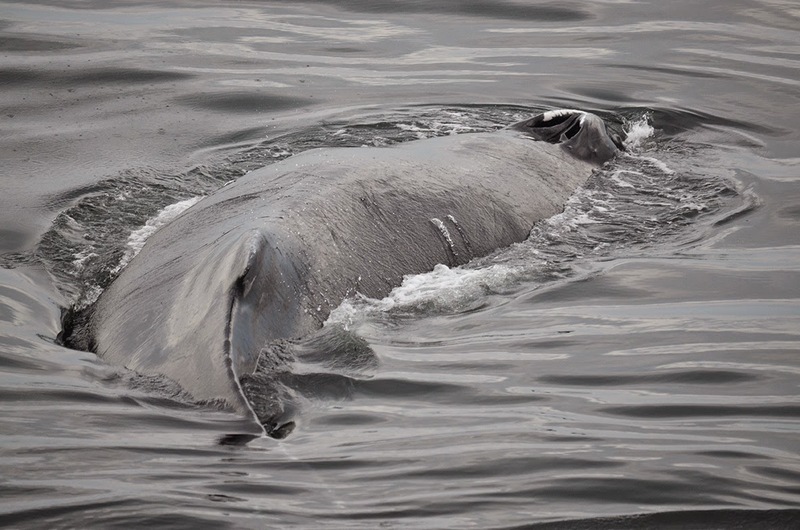 Subterranean blues: Took a long while before we could ID this whale! Satisfied with an id shot we headed off to explore further and quickly spotted another whale travelling slowly. This whale was taking shallow dives and the near glass calm seas today allowed us to see the trail of fluke prints, slick patches of displaced water created by the animal’s tail, leading in a straight line to some destination unknown. It seemed to be heading in the direction of some more blows so in the spirit of discovery we went to see who these whales might be. This time it was a group of 4 humpback whales and I was quickly able to identify 3 of them: Tornado, Echo, and Ventisca. 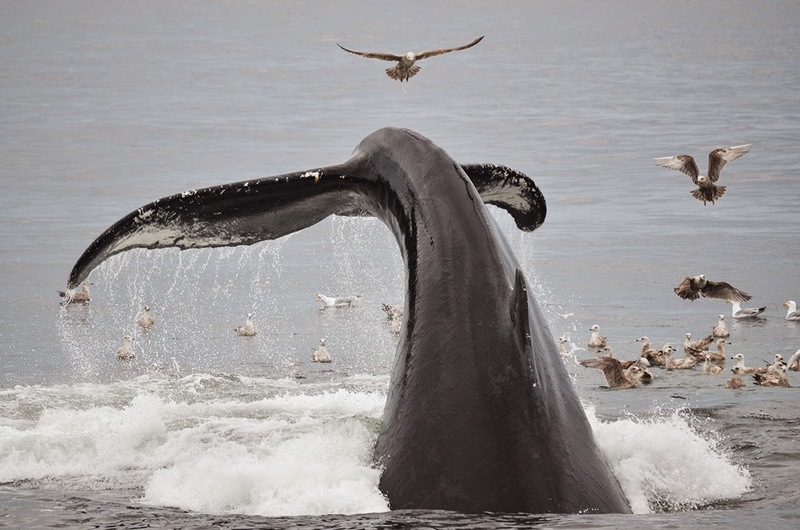 The fourth whale, despite a good picture remains unknown. These three whales are all females, who had calves last year, and in fact I saw Ventisca’s 2014 calf on a trip earlier last month. They are well known and regular visitors to Stellwagen Bank. Echo is the first whale that I have sighted all four seasons that I’ve been working out here and Ventisca is the first whale I ever learned to id. Like many of the whales earlier in the trip this group were taking shallow dives and just travelling along. We got to spend some time for a few surfacing and the captain called that our time was up and we headed back to Boston. It was a wonderful whale watch, spending great quality time with 7 different humpback whales and I’m sure everyone on board was very pleased. 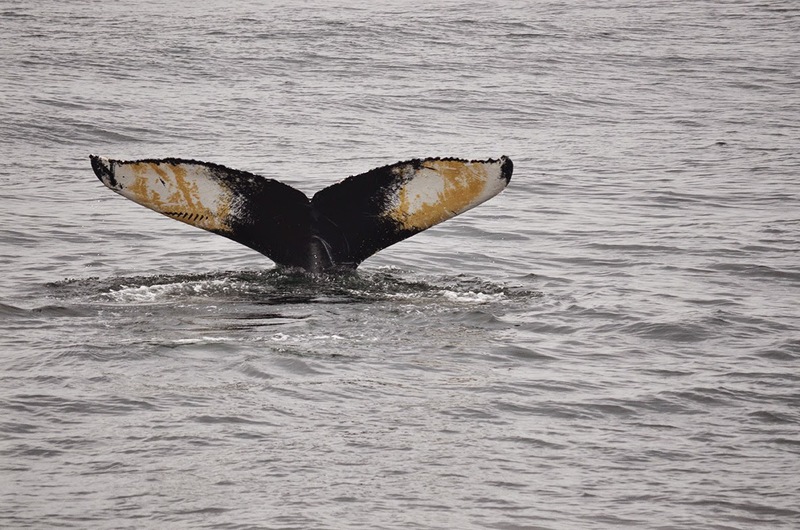 As we headed west we started to spot some more whales in the area and even a small group of feeding humpback whales. 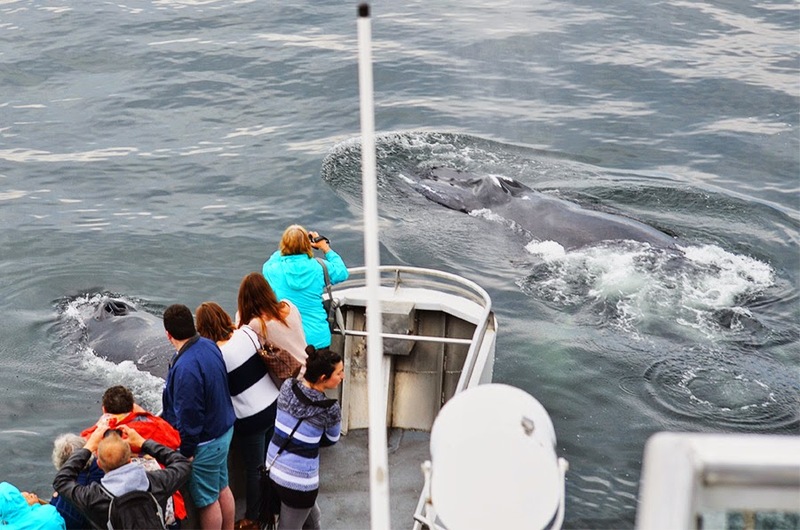 On the way out to Stellwagen, our captain had spoken to a friend on one of the tugboats heading down from Portland who said he’d seen some feeding whales. We figured this had been a group of four but boy were we wrong. Our captain figured we had just enough time to swing by these feeding whales and get some additional looks. Suddenly there were 16 whales in small groups kick feeding and lunging all around us! We stayed between two pairs – Glo-stick and Pleats, and Triton an Reaper – who gave awesome kick feeding action of either side of the boat before rising open mouthed to the surface to be mobbed by the hundreds of gulls. It was a sight to behold! Kick feeding, when the whale slams its powerful peduncle on the surface of the water, is an amazing and dynamic behavior to watch, especially Glo-stick’s particularly “flippy” style. At last we really did have to leave and head home but it had been an excellent trip with 20-22 humpback whales and 4-7 minke whales and hundreds of sea birds and tons of fun!